HeliBars has been working diligently with Motus Motorcycles since March of 2012 to complete the handlebar portion of the new MST & MST-R motorcycles. We are so pleased to be the chosen manufacturer for this ground breaking motorcycle. HeliBars for Re-creation/Recreation: It’s all about the fun! A recent article in the Powersports Business Magazine (September 9, 2013 edition, online October 4, 2013) had us all talking here in the office. Why do we make HeliBars? We say it’s because we want people to ride for the “long haul” and enjoy “comfort without compromise” because people should be able to follow their passion (for motorcycling) without pain. It’s because we love the feel of the open road. It’s how we recharge our batteries from working all day. And because there is no greater joy than traveling this great country from the back of a motorcycle and seeing all the beautiful sites while riding through the wind. All of this is echoed in the article we read. On the lookout for: More Motorcycles! If we use your bike you get the first production set for FREE. Sweet deal right!?! Also, if it’s Winter (like it is now) we will keep your baby safe and secure during those cold Winter months, keep the battery charged, stabilizer in the tank and ready to go when it’s time to pick it up. Yamaha FJR1300: Why a Replacement Triple Clamp? 1st: The stock triple clamp on the 2006-2012 has a horizontal mount for the handlebars. So any riser that would be added onto the triple clamp would only make the handlebars taller, not closer to the rider. (And really that’s what people want is the bars closer to them so they aren’t stretched over the tank.) Also the handlebar mounting hardware complicates any riser design. 2nd: The stock clamp is very wide front to back and this uses up cable and hydrualic line slack very quickly when the controls are raised and moved back. 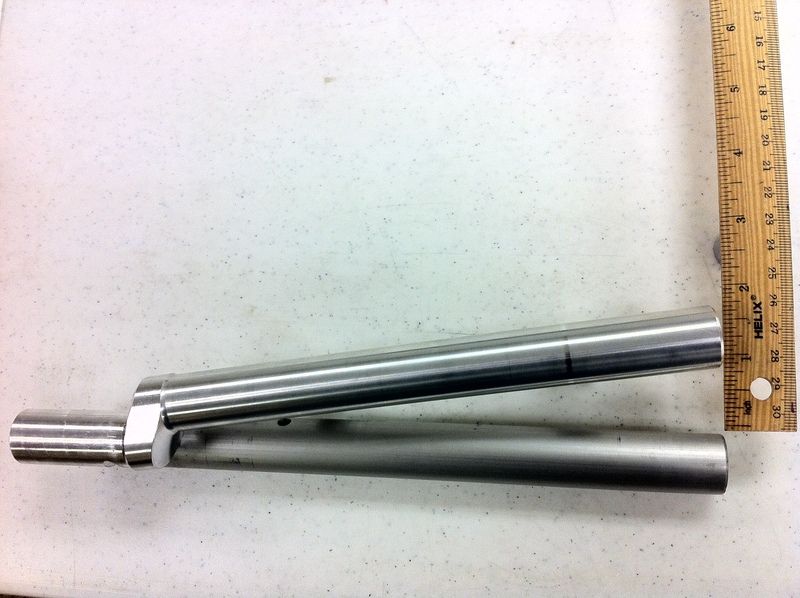 3rd: The stock triple clamp is rather thin sectioned and uses a single fork tube pinch bolt per side. This is one of the reasons FJR’s have a buzz at cruise speed. All three of these issues are addressed in the redesigned triple clamp (HRT076-2 or HRT076ES-2). 1 1/4″ to 1 3/4 ” rearward (towards rider) with the option of 2 handlebar mounting locations. “Rise”? “Pullback”? “Rear Offset Location”? It’s all Greek to me! What do you mean it’s only 1 1/2″ taller? Are you sure that’s going to make a difference? These are all questions I hear daily. Case in point. I received an email this week telling me that our advertising was wrong. The bars were not 1 5/8″ taller. So we did a little photography for proof that we were indeed 1 5/8″ taller. Stock bar for Hayabusa on Bottom, HeliBars for Hayabusa on top. Here’s the facts: Our product specs are measured at the end of the bar, where you place your hands. We take measurements from the stock location to the new HeliBars location. This tells you exactly where your hands will be and really this is the information people want. Let’s talk “pull back” and “rear offset location”. Basically, we move you up and back into your seat more. So “pull back” or “rear offset location” means moving your hands closer to your torso. A great resource for finding out how that “minor” 1 1/2″ adjustment is really going to affect your riding position is Cycle-Ergo.com. There you can pick your motorcycle, your height, inseam and then vehicle customization. Some people are strictly visual people and this site is a fantastic resource to help give you that visual. The bottom line. Our products work. We have been producing HeliBars for 25 years and we offer a 30 day money back guarantee. What’s our return rate you ask? Less than 2%. Almost unheard of. People just love our bars! The Quest for Supreme Motorcycle Comfort: It’s on the Horizon with HeliBars! Motorcycles are designed to fit into a category – touring, sport, etc. – and the styling (including handlebars) is driven by what’s traditionally acceptable. What’s visually appealing about a certain bike does not necessarily make it comfortable. Our quest to find that elusive “comfort zone” while riding has been our journey for over 25 years, and it’s why we spent 10+ years developing the patent pending Horizon Product line. This unique handlebar allows you to find your comfort zone, because it’s multi-adjustable. It’s what? I said – it’s multi-adjustable. The bars adjust in three locations. Where they mount on the bike (forward & back), where the handlebar tube meets the mounting bar (forward & back which raises and lowers grip angle) and the handlebar tubes themselves (in and out to allow perfect wrist angle placement). Below is a diagram of the newly released ST1100 multi-adjustable handlebars. “It took years for this product to become available to the public – it was first introduced in 2007 to the Touring Market with models available for specific Harley-Davidson motorcycles. Since 2008 we have increased the Tourer market and installed on motorcycles such as the Vulcan, Triumph Bonneville America, Yamaha V-Star, and Victory Cross Country. In the last year we have transitioned the design into the Sport Tourer Market with much success!” says Harry Eddy. HeliBars also offers Horizon models for the Kawasaki Concours14 (C14), Honda ST1100 and the Honda ST1300. These products are going to take the industry by storm. Check them out at www.HeliBars.com! Brought to you by Heli Modified Inc.: The Makers of HeliBars! People always ask: Why can’t I use my HeliBars as a tie down point? Before I answer that I have a couple questions, if you put your arms straight out sideways and ask several children to hang onto them – will your arms break off? Probably not. Will they stay straight? Probably not. Now if you asked them to hang from your shoulders you may bend in the knee a little (sort of like your tire being compressed) but you are more likely to stay upright with your arms out straight! Let’s think of your handlebars as arms and your frame of your bike as your torso. So where is the best point to tie down your motorcycle? Why can’t I use my HeliBars as a tie down point? Over the years we have had this question asked thousands and thousands of times. We stress that they can certainly be used as a stabilizing point. (Heck that is why we have arms right?) Extreme force on the ends of the handlebars (either HeliBars or stock handlebars) can bend the bars or rotate them in their mounts. And while you don’t think you tied them down too tight, if you hit those beloved pot holes while truckin’ down the road that force is increased. Use a wheel chock. There are some great ones on the market that we use such as Condor; they make a great quality product. Pull the machine down and forward while locking it in. Use soft ties or something similar around the lower triple clamp to stabilize the bike. And lastly, you can utilize something like Canyon Dancer to steady your bike from lateral sway.